Photo courtesy Springfield Technical Community College. The Advanced Manufacturing Workforce Plan addresses the sector’s need for a more highly skilled and educated workforce and public higher education’s role in preparing this workforce. The data presented in this report suggest that there is currently a sizable workforce supply/demand gap (demand exceeds supply 2:1, conservatively), and that the emerging requirements for the next generation workforce must be addressed by higher education in advance of employer demand to ensure Massachusetts future competitiveness in this important sector. The term advanced manufacturing is used to broadly describe a major segment of Massachusetts’ economy that encompasses an array of industry specific sub-sectors. These include: Computer and Electronic Products , Fabricated Metal Products and Machinery, Chemical and Plastics (incl. Pharmaceuticals), Medical Equipment and Supplies, Food Processing and Production, and Paper and Printing. 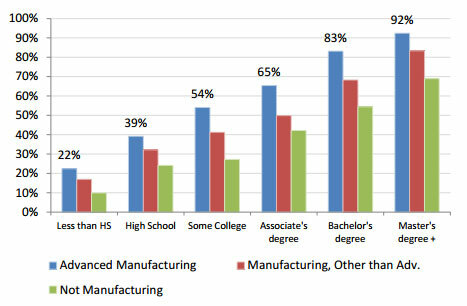 Advanced manufacturing jobs provide rewarding opportunities for new as well as established workers who seek family sustainable careers that have middle-skill education entry points and provide opportunities to progress in these careers through attainment of postsecondary certificates and degrees.